When Debra Doda was looking for a new house, one of her first questions was whether the community had a theatre group. When it came to Raymond, the answer was yes, and she moved to town in 1998 – and has been an active member of the Raymond Arts Association ever since. Raymond Arts began in 1983, following a successful Raymond High School production of “Night Must Fall.” The group followed in the local tradition of live performances that began in 1951 at the Hutchinson Summer Theatre on Governors Lake. And while the theatre is no more, the Town continues to be home to a vibrant group of actors, lighting and sound technicians and stagehands. In recent years, Raymond Arts has been providing the community with three events each year - a play, a dinner theatre production and a variety show. The variety show recently took place, and a play titled “Dilemmas with Dinner” will take the stage April 27 and 28. Early performances were on the old high school stage, at the site of the present Iber Holmes Gove Middle School; the plays are now produced on the Raymond High School stage. Through the years, Raymond Arts activities have included fine art shows, Town Fair skits and costume booth, a haunted house for elementary school-age children in conjunction with Raymond Recreation, Arts in the Park, a craft fair, and fundraisers held with the Veterans of Foreign Wars and American Legion, Raymond Area Rotary and Raymond schools. Member Richelle Hickok runs a summer theatre camp through Raymond Recreation. But even as the craft fair, for example, grew too big for the theatre troupe and was taken over by the Boy Scouts, the focus on community theatre remains strong to this day. “We’re directing our efforts toward shows,” Hilchey said of the group’s current focus. Money raised from ticket sales and donations goes to a scholarship program for Raymond High School graduates who plan to pursue an arts-related field of study. Financial need and academic performance are taken into consideration as well. Longtime Raymond Arts members and husband and wife Susan Hilchey and Bob Gagnon live in what remains of the original Hutchinson theatre space. They are devoted promoters – and performers - of the arts in town. Members meet once a month in the evening at various locations. New members, whether with interests on or off stage or both, are always welcome. Doda said Raymond residency is not a prerequisite for membership, and some members live as far away as the seacoast. “The members are really nice, kind, welcoming people,” she said. Doda added that when she played the title role in “Hello, Dolly,” an employee of a local store recognized her – not as Deb Doda but as Dolly. She said she loves that small town feeling. Raymond resident Jonathan Wood, who has produced the group’s variety shows from the start, heard about Raymond Arts when the group announced it was putting on a show. “I went to a rehearsal for set production and helped them build custom items,” said Wood. He likes working off stage, and has only played an on-stage role once – for one scene - when a cast member quit and it was too late to recast. Doda, on the other hand, likes to act as well as to direct. In addition to directing this year’s spring production, she has directed several other plays for Raymond Arts. Her first directorial effort was in 2004 with “Don’t Drink the Water,” and the signs announcing the play led to calls to Raymond Public Works from residents who feared something was wrong with the Town water. Of her upcoming production of “Dilemmas with Dinner,” Doda said the play is now in rehearsal and is lots of fun. “We have people who are new to the group as well as old favorites, and it looks like it’s going to be really good. It’s moving right along,” she said. The group keeps tabs on the interests of the community and adjusts accordingly. Raymond Arts staged dinner theatres starting in 2001 and then saw interest wane. They started them up again – to sell-out success – in the past few years, after residents asked for them again. There had been no variety show in Raymond since a production that celebrated the Town’s 200th anniversary in 1964. Sally Paradis of Raymond recalled that those shows sold out on multiple nights and had about 300 people in the audience for each performance. In 2006, she suggested to Wood that it would be nice to have a variety show again, and he has been the show’s producer and director almost every year since then (see related story below). Hilchey noted that Raymond Arts often does joint projects with the Raymond High School Drama Club. Gagnon is drama coach at the high school and is about to stage his 30th production there this spring. He has worked with the local middle school’s students as well, and this year has been hired to do a production that will be based on James Thurber stories. “It’s a labor of love,” Doda concluded. For information about Raymond Arts, call 895-4030. • “Dilemmas with Dinner,” a farce directed by Deb Doda, April 27 and 28. Raymond High School. • “Death by Design,” dinner theatre, a murder mystery directed by Phil Hammond, June 15 and 16, 22 and 23. Raymond Masonic Hall. 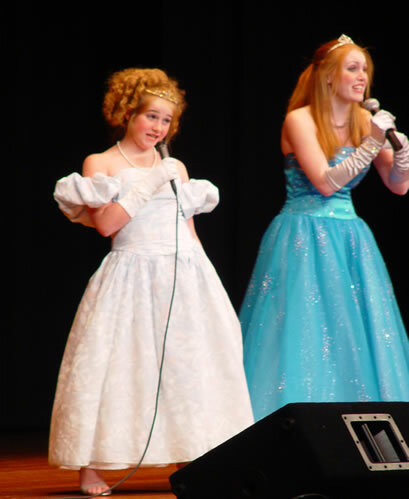 The Raymond Arts Association Variety Show has become a staple in the local community ever since it was reprised more than 10 years ago. When Raymond resident Sally Paradis, recalling the success of a show staged during Raymond’s 200th anniversary celebration in 1964, mentioned the idea of having a variety show to Jonathan Wood, he decided to give it a try. A member of Raymond Arts, he broached the idea of a Johnny Carson format show to the group, and it took off from there. “We have two hosts who interview the performers after they perform,” he said, noting that gives the stage crew a chance to change the set in between acts. Wood holds tryouts each year, and those who want to perform can send him a video of their performance, or he will visit their home or other location to watch their act. Wood has never performed in the show himself, but enjoys the role of producer/director. “I don’t necessarily want to be on stage,” he said. 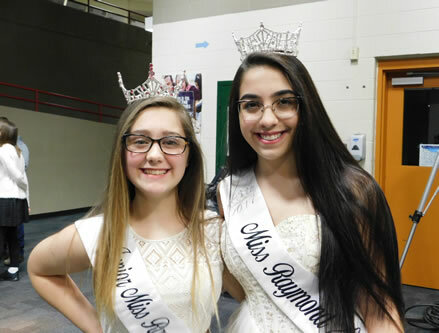 The variety show usually is held in the fall, but a conflict in dates with the school district – the show is held on the Raymond High School stage – led to its rescheduling to February this year. He expects it will return to a fall date in the future. “The show is a big moneymaker for Raymond Arts,” Wood said, noting no one gets paid, while the money raised goes to the group’s scholarship fund for Raymond High School graduates pursuing studies in the arts. While every year brings different talent to the show, Bob Gagnon has been its host since the beginning. Co-hosts have changed through the years, and have included Jane Button, Deb Doda and Richelle Hickok. 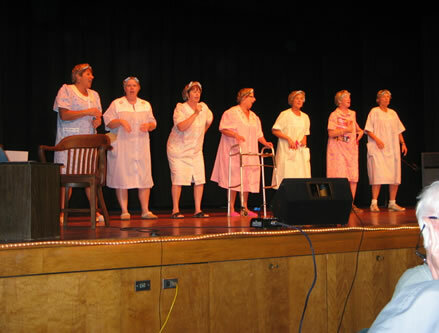 One of the highlights every year, ever since the second show, has been the “40ish and Fabulous” skit involving local women. And the show can become a family affair. 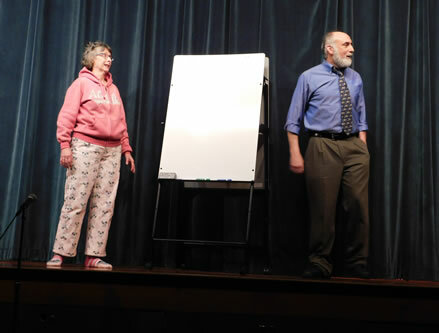 This year Raymond resident Christina Vogel, who has performed Ukrainian folk dancing in past shows, took part in the “40ish and Fabulous” skit, while her husband, Doug, assisted Francis McManus as stage manager. In past years their daughter Katarina, who is now in college, regularly performed a ribbon dance. “But the bottom line? “It’s a way for the community to get together and have some fun,” he concluded. The Raymond Arts Associates is an organization deeply invested and ingrained in the Raymond community. Through its activities and the events it promotes, Raymond Arts reaches out to residents by providing art as a way to connect with others and the community itself. It all began back in 1983, when Raymond Arts Associates was created by Ardell Welch, Diana Dawes and Donna Toto of Raymond and David Ramsey of Kingston. Plays were produced and presented in the Hutchinson Summer Theatre on Governor’s Lake in Raymond, planned and designed by Susan Hutchinson. The original theater opened in 1951 but went dark with Hutchinson’s death in 1956. The theater came back to life with summer stock productions with Frank Wells and Loren Morrill in 1962, and continued to operate under the leadership of Dr. D.C. Anderson until 1971. The theater building itself has mostly vanished, with the remaining portion converted into a private home where Susan Hilchey and Bob Gagnon have lived for 25 years. But theater is still prominent in Raymond, with the tradition of live theater encouraged and supported by Hilchey and Gagnon and their fellow members of the Raymond Arts Associates. “We want the Raymond Arts Associates programs to be real community programs,” said Hilchey, who is active with, Art in the Park and the Raymond Historical Society as well. Wood said many of the Art in the Park productions are staged to help finance Raymond Arts Associates’ play costs and to allow the purchase of theatrical equipment that can be used by Raymond Arts Associates, Art in the Park shows and the community as needed. Art in the Park takes place at Riverside Park, unless inclement weather forces it indoors. Hilchey said the local talent for the variety shows runs the gamut from jugglers, dancers and singers to magicians and dog obedience. Raymond Arts Associates does not own a theater, and Hilchey thinks many residents may be unaware of the organization’s existence. But the Raymond Arts Associates’ live performances bring the community together, and are announced on large signs strategically placed at busy intersections. The performances take place at Raymond High School, where Hilchey notes many dinner theaters and old favorites have been performed over the years. But Raymond Arts Associates is not limited to theater productions. 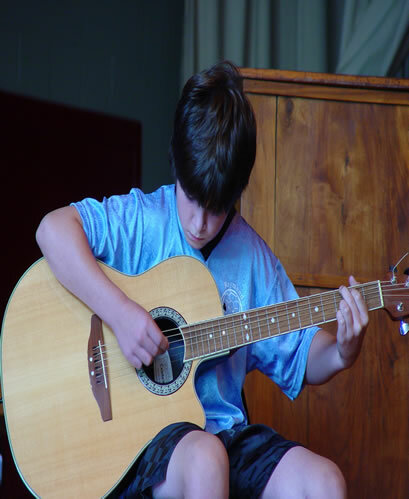 Members get involved in many other activities, including variety shows, fine arts shows, talent shows, and craft fairs. The organization also awards college scholarships to Raymond High School seniors who plan to enter the arts profession. And this year, as Raymond celebrates its 250th anniversary Sept. 13-21, it’s likely you will find Raymond Arts members involved in the “My Town, Your Town, Our Town” activities, which include an opening ceremony, parade, barbecue on the Town Common, band concert and fireworks, all concluding with the 250th Anniversary Ball. Raymond Arts Associates and its activities exist because of volunteers and provide lots of opportunities to residents to get involved and ultimately bring out the best in town. Gagnon is as invested as Hilchey and coaches the Raymond High School Drama Club, producing plays at the school. 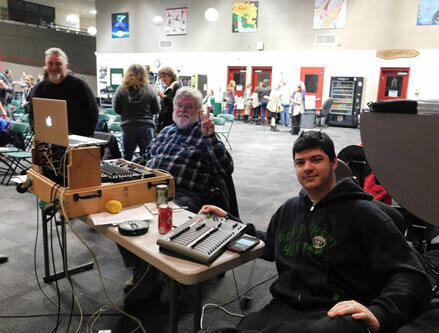 “This is a man who can’t sing or dance but is able to direct wonderful musicals,” Hilchey said, calling him a jack of all trades for the Raymond High theater productions. And when not involved with drama at the high school, he is knee deep in Raymond Arts Associates’ theater productions and activities. Raymond residents and people in neighboring communities are encouraged to take advantage of the live theater productions and other artistic events put on by Raymond High School, Raymond Arts Associates, the Raymond Historical Society and the Art in the Park program. Go to the Calendar page of Raymond Area News at www.raymondareanews.com to find out when programs are planned.